Long ago, around the turn of the century, the Bob Dobbs symbol was everywhere in Brighton. Inspired by the American Church of the Subgenius, Jim Bob began to use the Dobbs head as a symbol for parties and general mayhem. He gave an excellent talk on this at the Wellebourne Society a few years back. 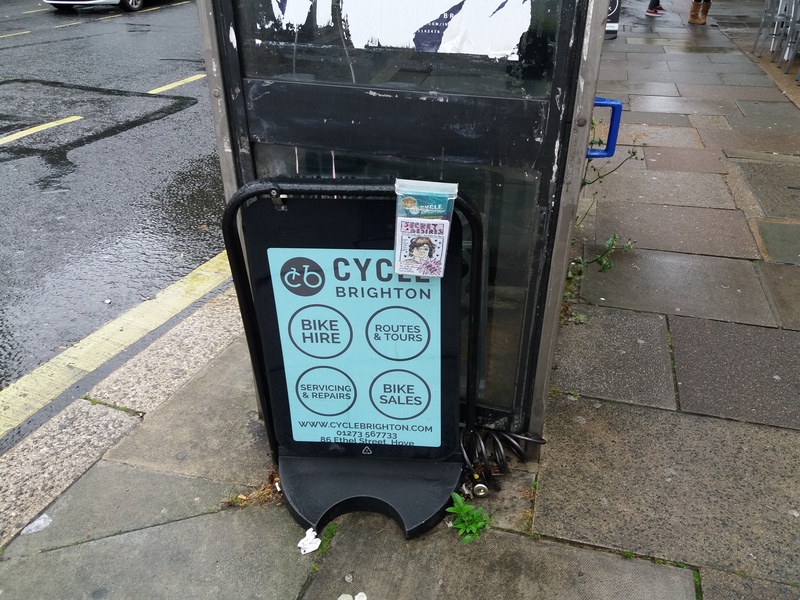 As with most interesting things going on in Brighton around then, I knew it was happening and never did much about it – although I did enjoy one of their pre-election fundraisers at the Concorde 2. The story of the Brighton subgeniuses is a fun one, with an entire movement accidentally being created. My favourite part of the story was the visit by the Church of the Subgenius’s American founders to see what was going on (and to ask about the cut of the merchandising they were supposed to get). At one point, in the ’90s, the Brighton [group] had a whole “Bob” storefront… they almost won a local election with “Bob” – Rev. Jim in a Giant-Dobbshead mask — running under the Dobbs Free Party banner; PISS, an air guitar band with Kiss-style Dobbsheaded members, had an actual recording contract… To many [Brighton people], the Dobbshead had always signified only a great party at Jim’s. They’d no idea that there were also dozens of books, CDs and films, assembled by hundreds of Subgenii from every other place in the world BESIDES Brighton. It was an almost Galapagos-like evolutionary situation, whereby a whole species had been cut off from its fellows and had advanced along completely different evolutionary lines. It’s good to see the Dobbshead turn up about the place again. I may not have been anywhere near this when it happened at the time, but it’s still a sign of the Brighton I love, a place of odd stories and strange societies. Posted on August 8, 2017 Author orbificCategories BrightonLeave a comment on Bob Lives! Via scribe, I recently read an article on kigo in the modern world. Kigo are the seasonal words and phrases used in Japanese Haiku. As the form has spread across the world, there is a debate over how these concepts translate and whether they are essential to haiku. Many kigo are local; for its entry on kigo, Wikipedia lists a selection of Southern Californian seasonal images. Last night I went for a walk along Brighton seafront. 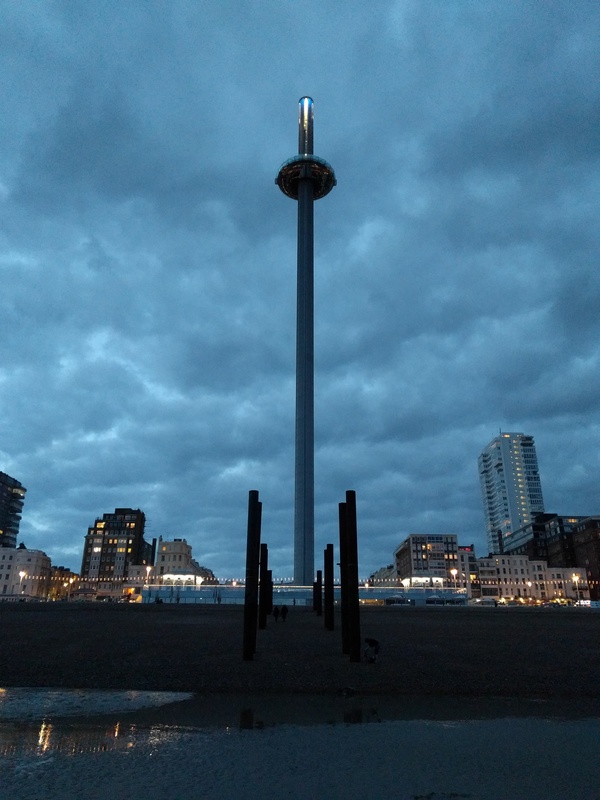 The i360 was dark, as if ashamed of its recent breakdowns. Crueller people, including the BBC, have labelled it ‘faulty tower’. The tide was out, meaning it was possible to walk along the sand. We could have walked among the West Pier ruins, had they not been demolished to make way for the i360. 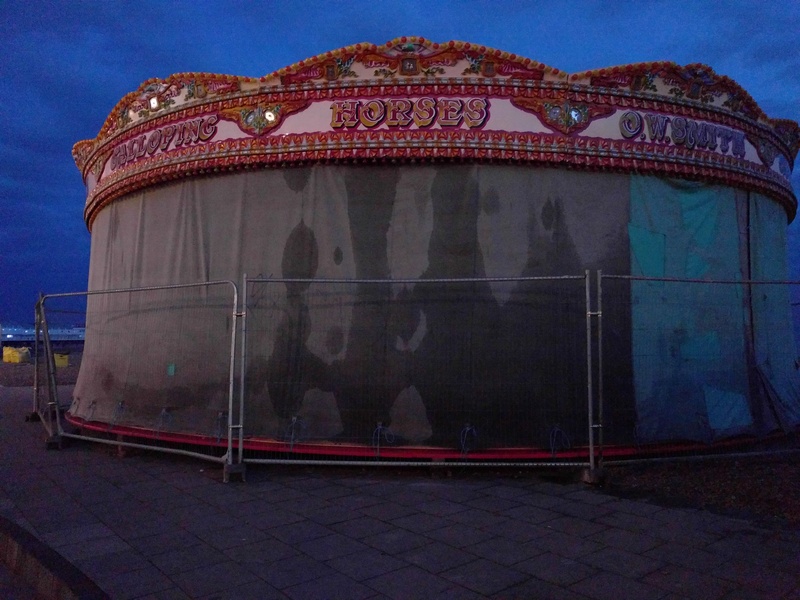 Further along the seafront the carousel had been erected ready for the summer season. 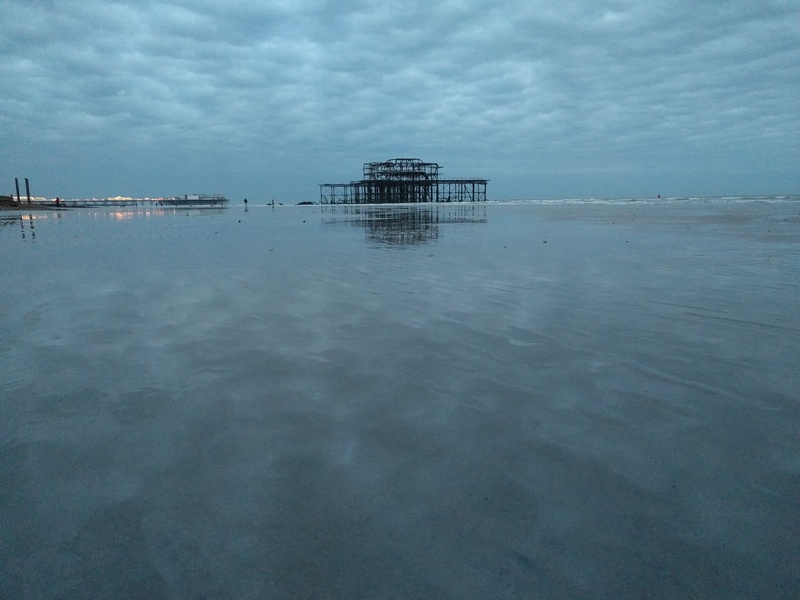 I don’t know exactly when it went up this year – it’s been a couple of weeks since I’ve been down this end of the seafront.A few years ago, I performed a piece called Two Towns, about how Brighton was two places, one in summer, another in winter. Brighton can be a depressing place in the cold, but it’s glorious on a sunny day. The return of the Carousel means the year has turned (see also: 2010, 2016). Last weekend, it was bright enough that I got my first sunburn while I was out hiking. The town is filling up with visitors and the clocks have gone forward, giving everyone a couple of hours between work finishing and dark. While there are people out swimming every day of the year here, it will be soon time for the summer swimmers to join them. It’s good to be in Brighton right now. 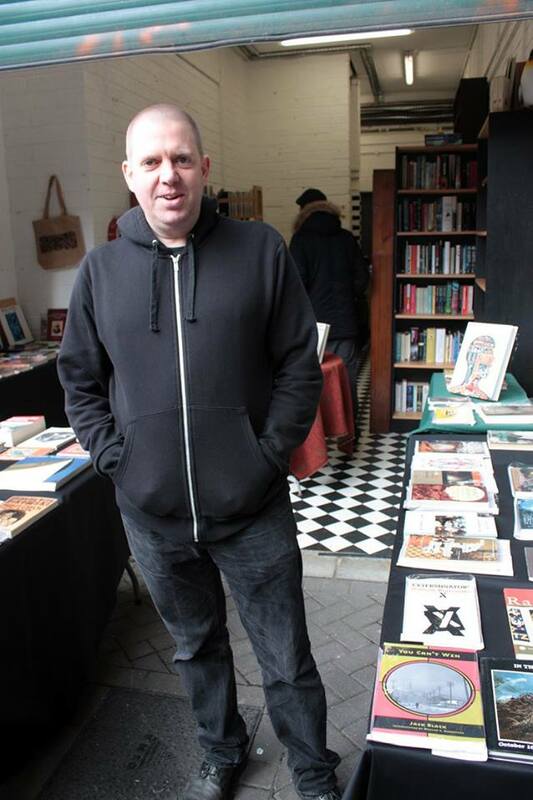 In May 2010 I wrote a post about the Lost Bookshops of Brighton. Visiting Brighton’s bookshops in the 1990s was one of the things that made me fall in love with this town. 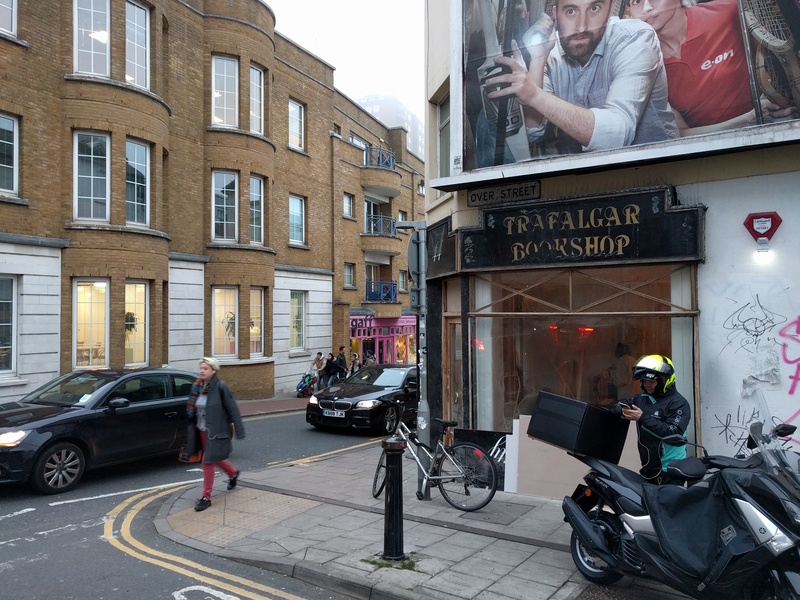 Over the last 20 years, most of the country’s second hand bookshops have closed, caught between Amazon and a surge in charity shops (who avoid many of the overheads of second-hand bookshops). I miss hunting for second hand books, something I used to spend whole afternoons doing. 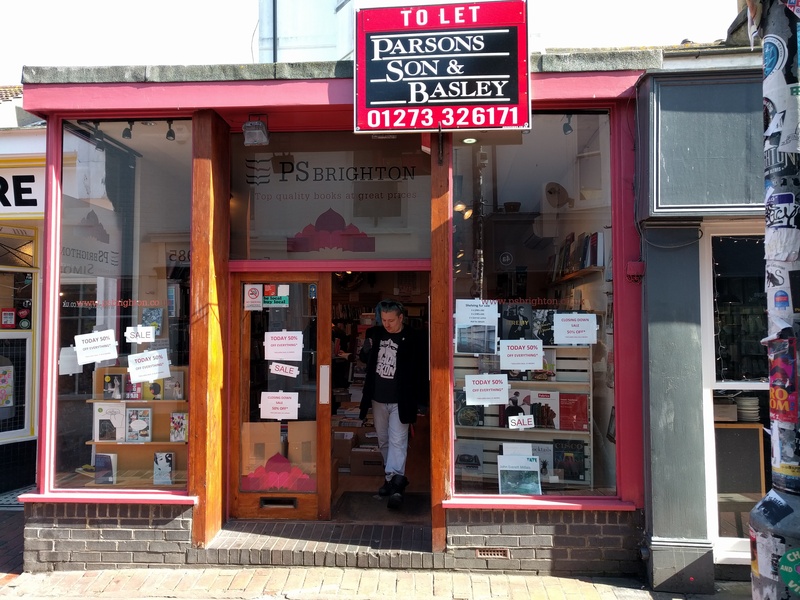 Another Brighton bookshop is about to be lost. 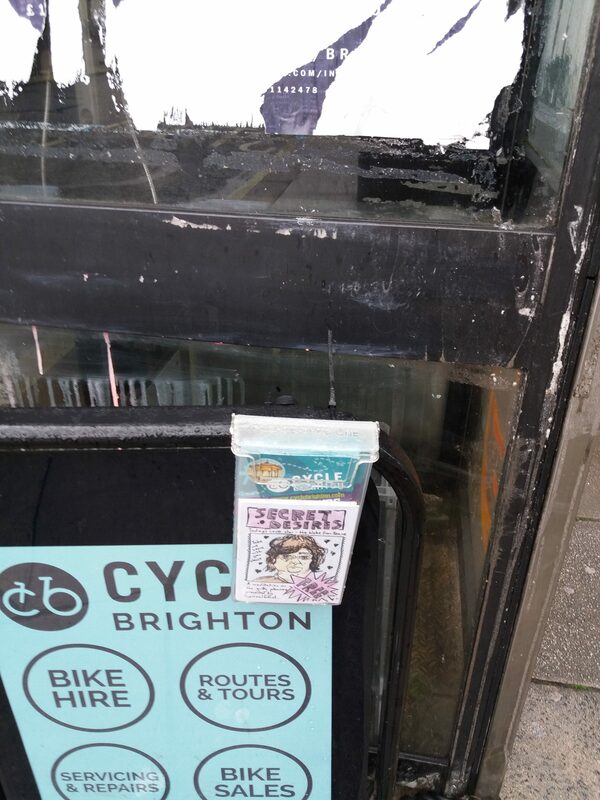 PS Brighton is covered in 50% discount posters, a ‘To Let’ sign hanging above it. 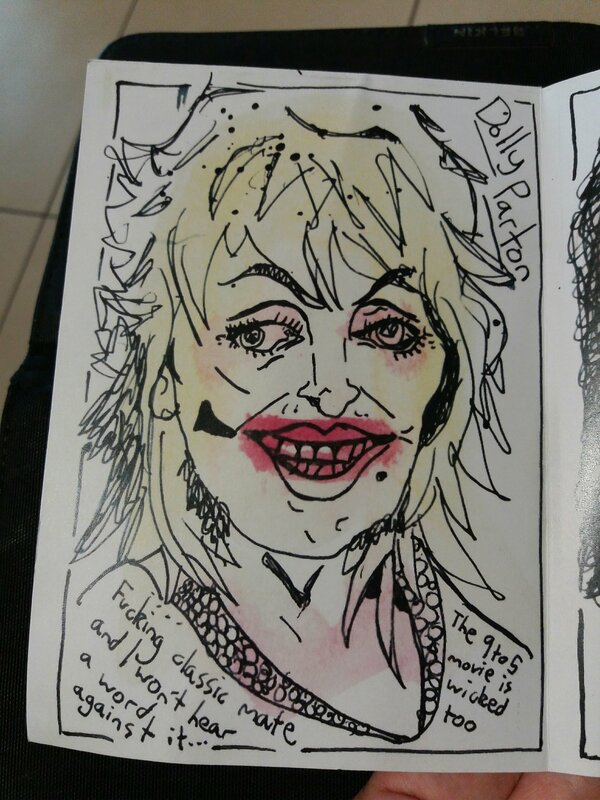 This was an excellent source for cult novels, rock biographies and art books. It’s going to be replaced by another coffee shop. The day after taking the photograph above, I walked down Trafalgar Street. The shop at the corner of Over Street, most recently a bike shop is being refitted. 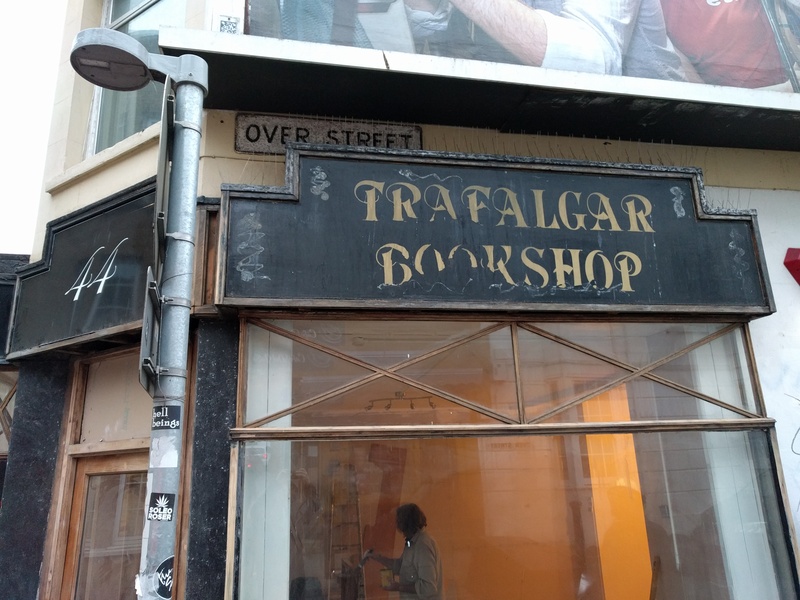 A ghost-sign has emerged from one of the shop’s former incarnations as the Trafalgar Bookshop. 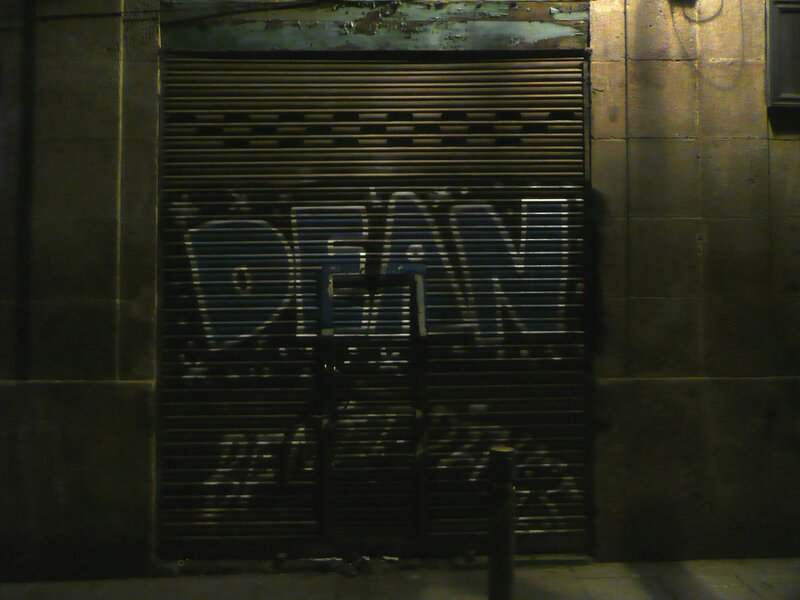 I can no longer remember the specific layout of this place, only that it was one of the places I enjoyed hunting. Rabbit Island was a bit of Brighton folklore. 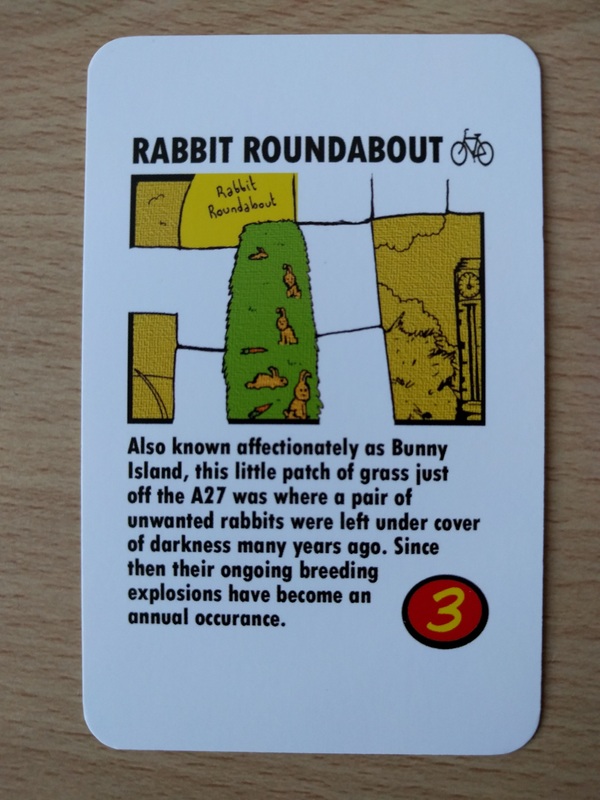 An overgrown roundabout on the way out of town, you’d sometimes see rabbits peeking out from the undergrowth. The story was that someone had placed a couple of pets there and they’d raised an empire. I’m not sure that makes sense – putting rabbits there rather than the neighbouring park would be ridiculous – but there were definitely a lot of animals trapped in a small area. It was a leporine equivalent of the TV show Lost. Earlier this year, the council cut back the vegetation on Rabbit Island. There is no cover, and there are no rabbits. All that remains on the island are a few pieces of metal piping. Apparently this was for safety, although the excellent Brighton Bits website points out that the foliage cut down headlight glare. It’s also a poor welcome for visitors to Brighton. 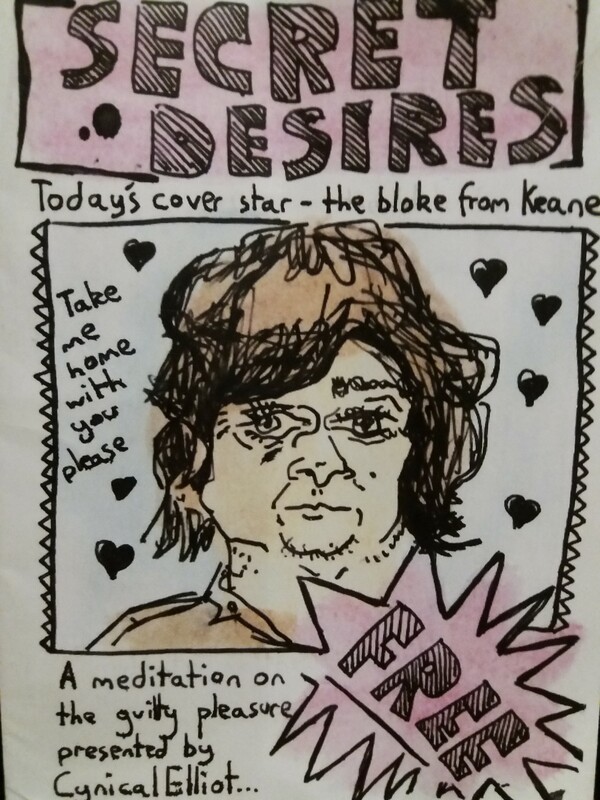 My friend Vicky Matthews asked what I was going to in this year’s Fringe. I thought I’d do a quick blog post in case anyone else is interested. There are lots of exciting events, although the best one sold out within a few hours. Alan Moore, John Higgs, Daisy Campbell, Shardcore and others are appearing at the Odditorium for Adventures on the Edge of Culture. I’m particularly excited by John Higgs’ piece Ziggy Blackstar and the Art of Becoming. Also, Alan Moore’s first visit to Brighton since who-knows-when is a big deal. . There are three other Odditorium events: Rupert Sheldrake, Everett True, and Boing Boom Tschak, a night devoted to Kraftwerk. I’ve bought tickets to all of these. A couple of years after his prize-winning show, Chris Parkinson returns with Apostrophe’s. I’m going to the showing on the 27th. Mathilda Gregory’s show My My Immortal is going to be amazing. There’s an interesting backstory to this but, even if you’ve never heard about it, the performance will awesome. Mathilda did part of it at the last Slash Night and killed. My friend Kaylee is helping produce a show called ‘Am I Fuckable‘. I don’t know much else about it, but what she’s told me makes it sound awesome. There are a few other events I’m considering but not sure about. I think I’ve booked tickets to a workshop on pilgrimage, but the Fringe booking system is being somewhat inscrutable. And that’s without even considering the usual free events, open houses and so on. May will be a busy month!